Tomorrowland is the movie I chose to see this weekend and from what my friends are saying about Poltergeist, I believe I made the right choice. If you've seen the trailer, Tomorrowland shows a girl pick up a pin with the letter "T" on it. When she touches it, she sees another world and escapes her current world. The protagonist's name is Casey Newton (Britt Robertson), daughter of NASA genius Eddie Newton (Tim McGraw). He doesn't really have a pivotal role in the film, but is nice seeing Tim act every once in awhile. But back to the story. Casey is a troublemaker and does all she can to prevent the demolition of a NASA project which might cause her dad to lose his job. A certain "recruiter" by the name of Athena (Raffey Cassidy) shows her the way to Tomorrowland and how she can use her smarts there to make the world to a better place before all humans destroy it. Tomorrowland centers around humans polluting the world and the only way to prevent that is by recruiting those who are smart in various subjects. Together, their goal is to make things better by working in Tomorrowland, away from politics and other distractions and biases. Casey and Athena must reach it before it's too late. 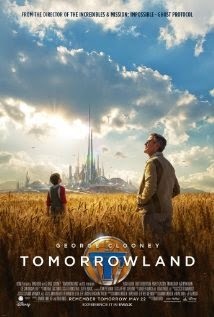 The only way to get there is through Frank Walker (George Clooney), a stubborn old man who was banished from Tomorrowland. They use weapons not invented yet and other gadgets to get to their destination and when they finally arrive, the world Casey saw is not as magical as it seems. To preserve both worlds, the group has to fight off a dangerous disease. Tomorrowland shows how pollution, wars and other human mistakes are slowly destroying the planet. It's a decent Disney adventure but I wouldn't say that it's a must-see. It was sure fun how they added sci-fi and future tech to bring Tomorrowland to life. Still, I'd pick this over a remade horror film. George, Britt, and newcomer Raffey were a fun team to watch.